I have dated this bike to the early 1950’s. It is most likely a 1953 model, given the “53” code on the Fratteli Brivio (F.B.) 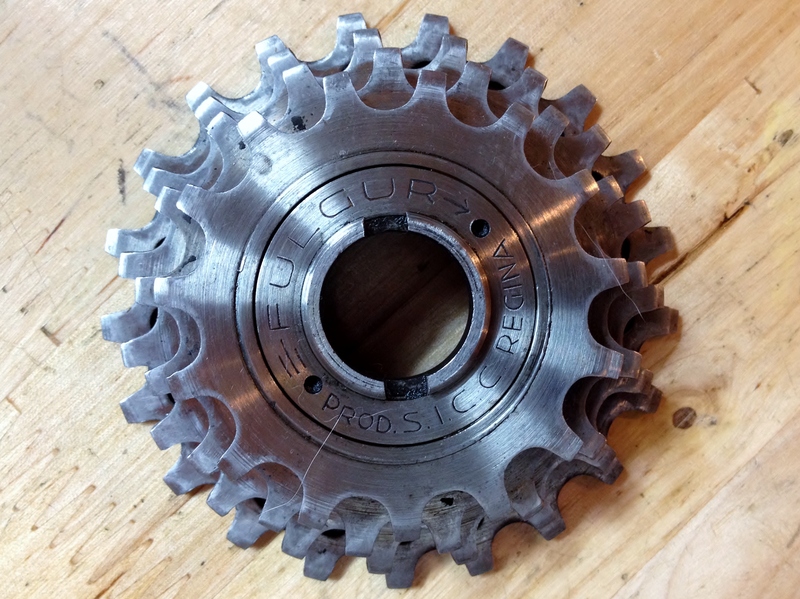 hub cones, the “53” code on the Regina 4 speed freewheel, and the Simplex Tour de France rear derailleur, which matches visually to photos of other TDF models I have located dated as 1953 models (and includes a few features not seen on the late 40’s models). However, there is also a “51” code on the Melas fork mounted dynamo, but an earlier date code for a component such as this doesn’t necessarily indicate the bike’s date of creation. Oscar Egg lugs. Note the small diameter tubes. 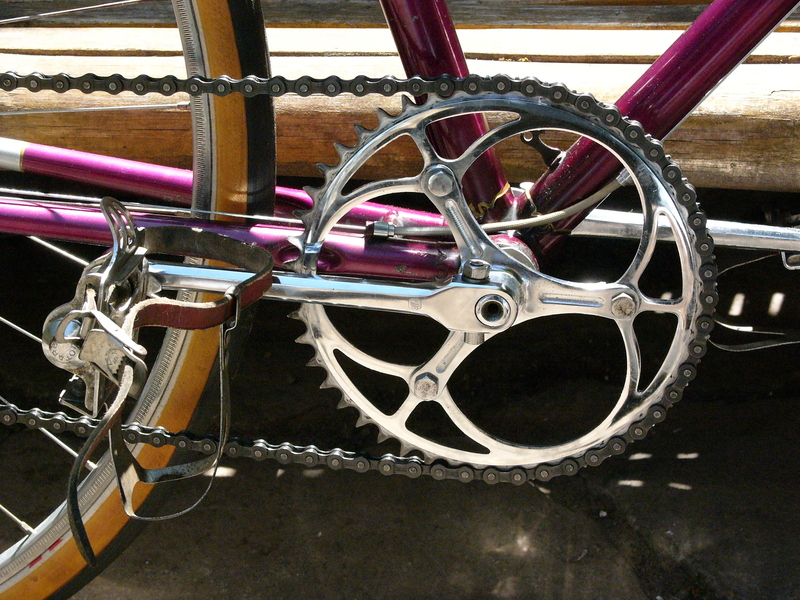 I say “creation” instead of “manufacture”, as clearly this unique mixte, with its Oscar Egg lugs, was a custom build. Unfortunately, there is no headbadge, nor are there logos of any kind present on the frame. 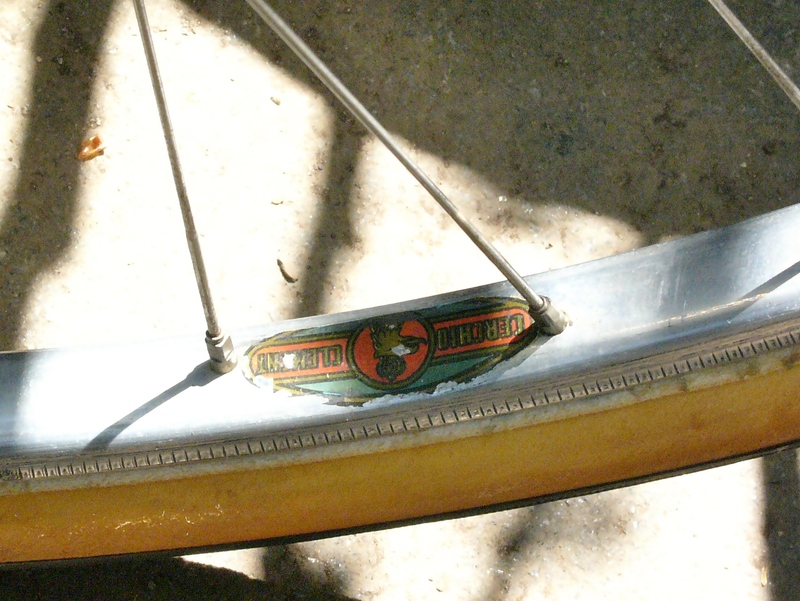 However, some barely visible white and orange paint artifacts still remain on the seat tube indicating the presence of transfers which have either faded or were removed. And, on the headtube there is a shadow of what was once an oval or triangular sticker. The fork is likely not original to the frame. Its brake reach is 7 mm longer than that of the rear brake reach, necessitating the use of longer reach Weinmann 810 sidepulls on the front (with the rear using a Weinmann 730). In addition, the downtube shows evidence of a front impact, further supporting my theory that the original fork was replaced. 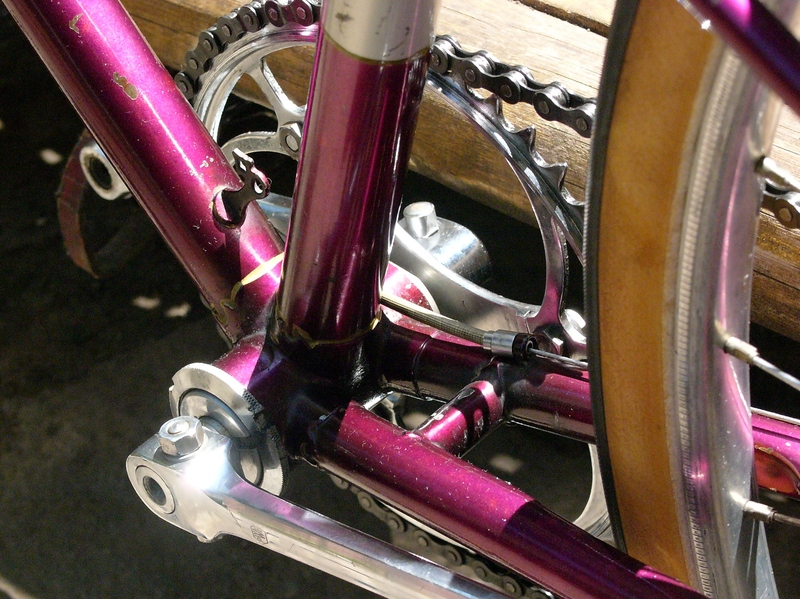 The fully chromed fork, although in beautiful condition, is not as nicely finished as the rest of the frame, with crude file marks still visible on the inside of the fork crown lug. The use of a longer fork than original means that the headtube angle is slacker than originally conceived. I measured it at 68 degrees, compared with the 71 degree angle of the seat tube. 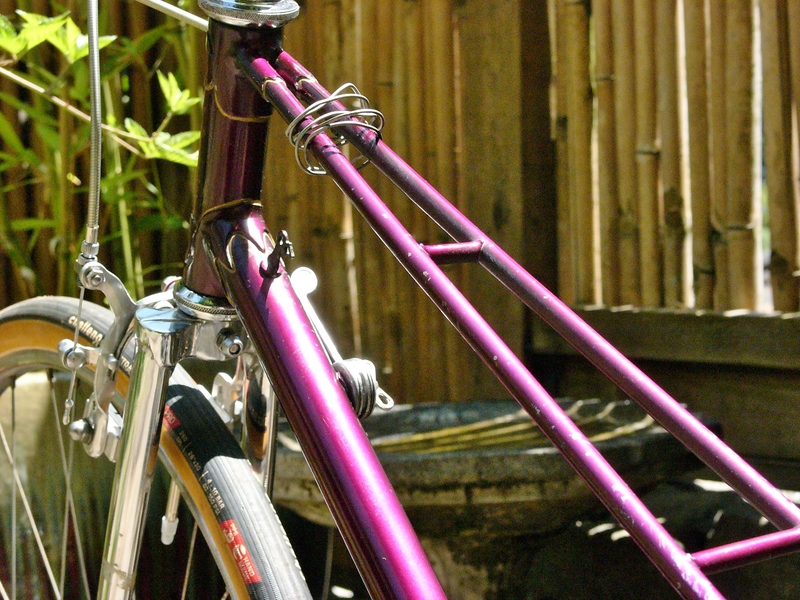 According to this helpful guide from Damon Rinard, you can determine the effect of using a longer or shorter fork on your bike’s original frame geometry. Conclusion: even fairly large length differences don’t matter all that much. An 11 mm difference in fork length only changes the head angle by .64 degrees. In this case, the slacker angle increased the wheel flop a bit, but the trail measurement of 58 mm and the wheel flop of 20 mm are still well within the normal range. This bike is a study in contrasts. It is built with top end, very light components. As pictured it weighs only 22 lbs. 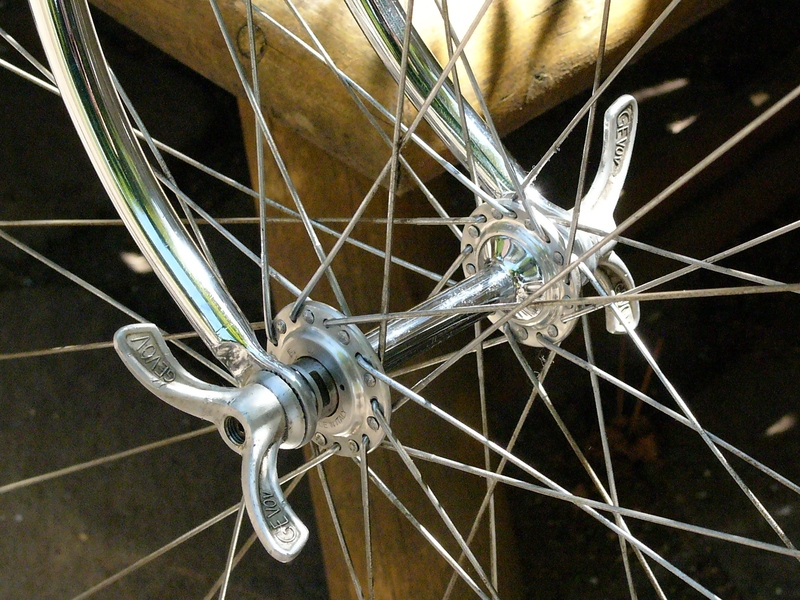 The use of the very best hubs available at the time laced to the Clement tubular rims indicate a rider who wanted speed and comfort, and was willing to pay for it. 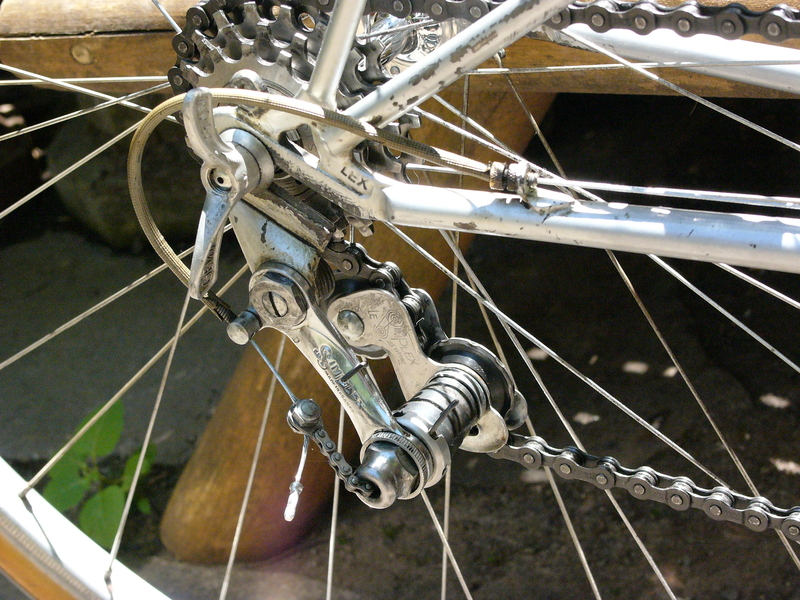 The timeless Marcel Berthet Lyotard pedals include Christophe toe clips and leather straps, further evidence that the bike was meant for spirited riding. 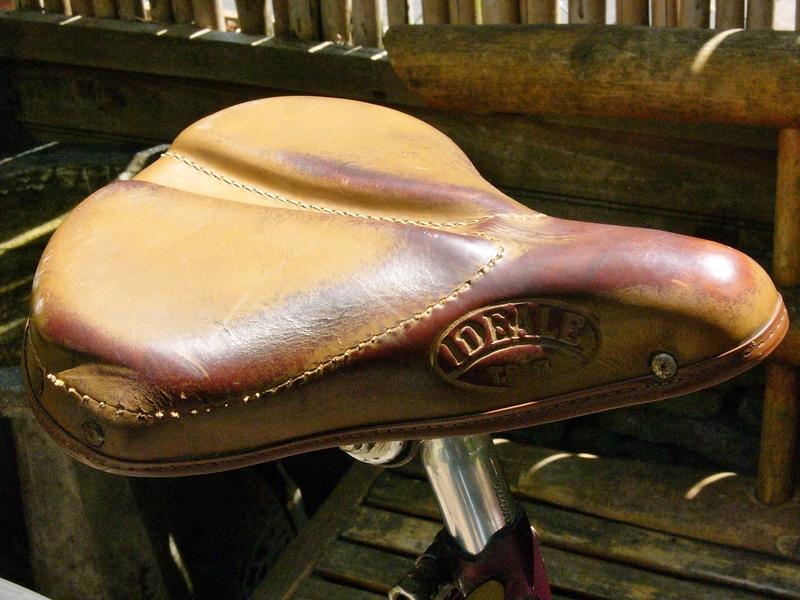 On the other hand, it has slack geometry, city style bars, and a heavy, but comfy Ideale TB 14 saddle. 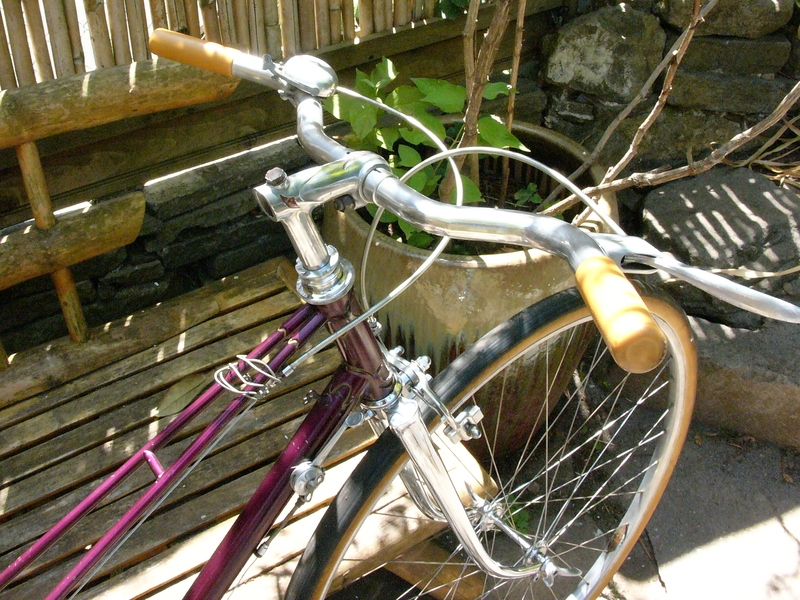 It is also a larger mixte frame, measuring 55 cm x 55 cm, with a very long 109 cm wheelbase. 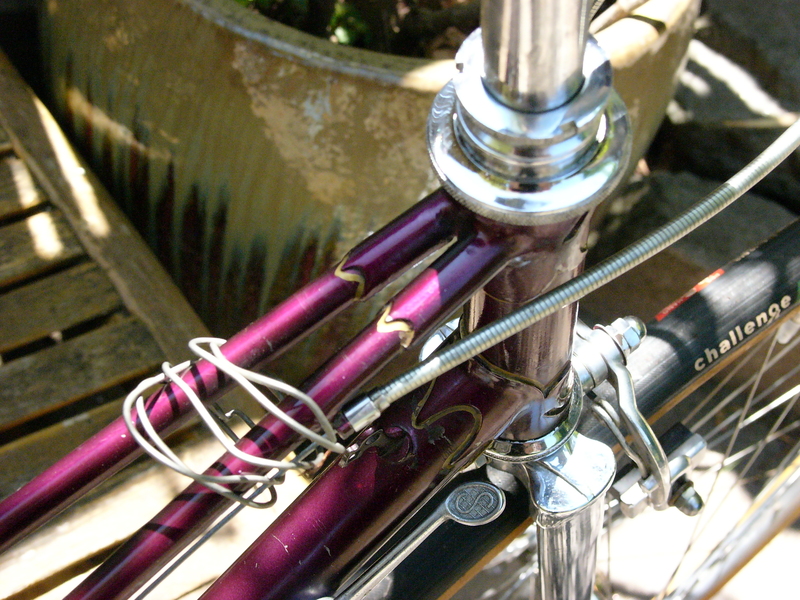 Although there are single fender eyelets front and rear, there are no rack mounts. When cleaning the bike, I found evidence that a rear saddlebag support had been clamped on the seat stays. The Regina drilled 4 speed Model Fulgur 15-17-19-21 freewheel was an especially nice bit to find on this bike. The teeth show no wear, and with a little oil and cleaning, it looks and sounds brand new. 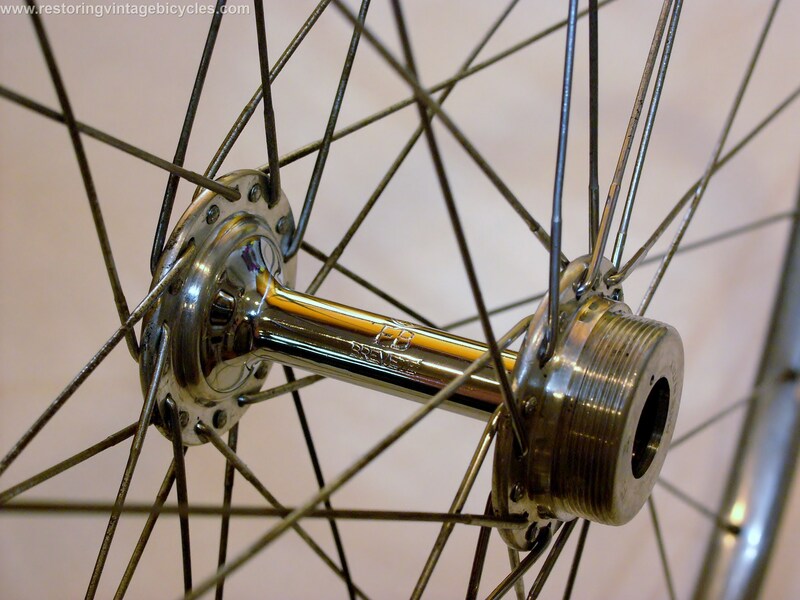 Some freewheels, such as SunTour and Regina, emit an incredibly pleasing sound, and this one is no exception. After setting up Simplex TDF plunger/pushrod style rear derailleurs more than a few times, I have finally got the hang of it. For this build,the derailleur responds extremely well and shifts as quickly as any modern derailleur, without any over shifting required. 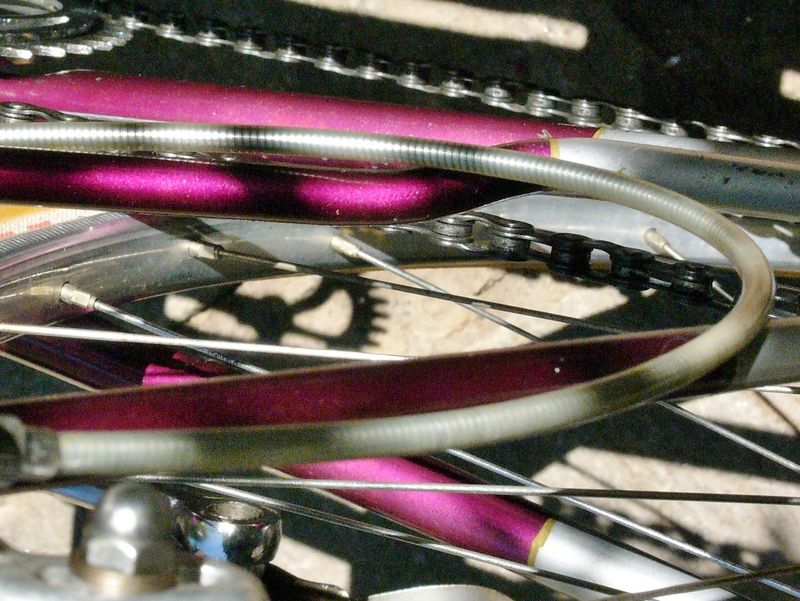 Fortunately, I had the original chain, so I was not left to guess about chain length, and I think that helped a lot. The new chain is a bit longer than I would have cut it if I had not had the original. 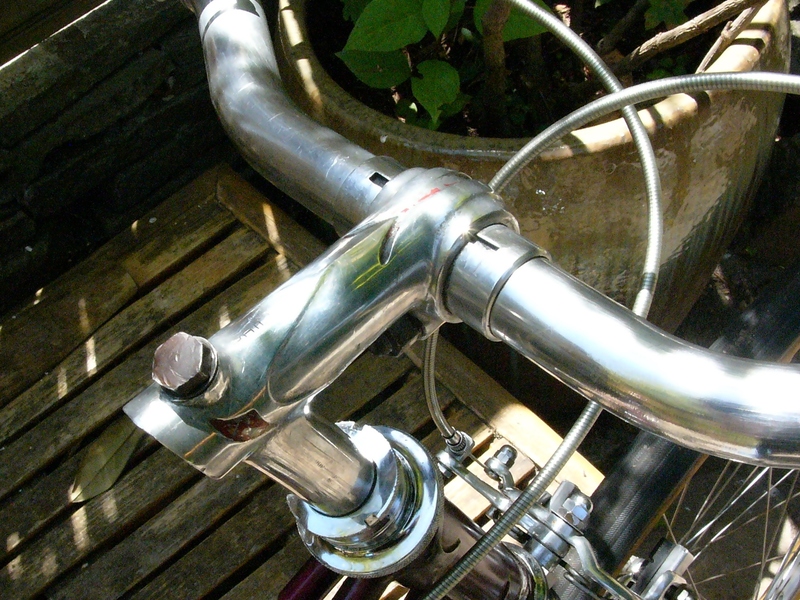 Highly polished stem, bars, and headset. All of the components had been highly polished, even the Weinmann sidepull calipers. Cleaning them was very easy. The frame took more work, as there was a heavy layer of gunk over the paint. The resulting sparkle was well worth it. I was very surprised at how nicely even the silver paint on the stays cleaned up. The bike really does look impressive. 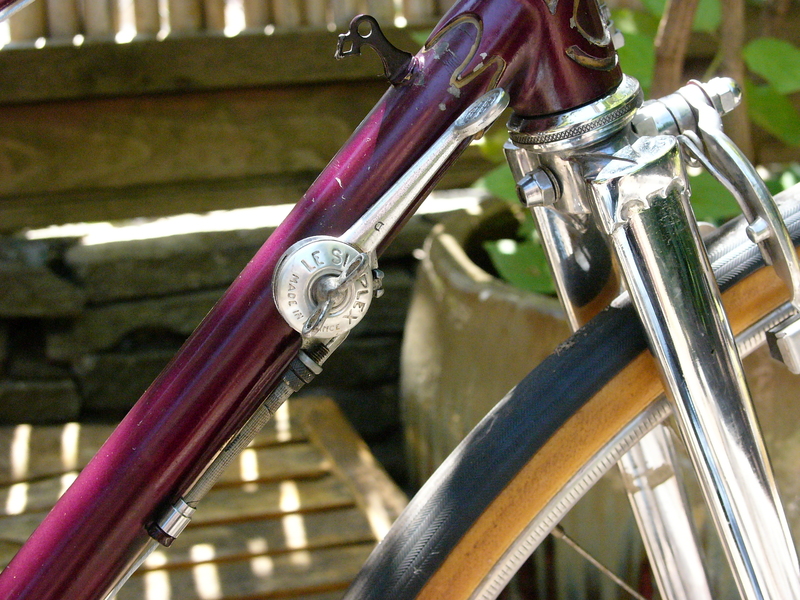 An unusual feature is the curved rear stay, to allow the brake cable to lay flush against the frame. Through the frame wiring for the fork mount dynamo, not yet installed. This was one of those bikes that I wanted to keep as original as possible. However, the frayed brake cable housings had to go, as they were not usable. I have a stash of vintage cable housing in various colors and from various periods. I have found that this silver colored housing which I believe dates to the 1960’s has a really nice vintage-y look. I had a length that was in good condition, so used it to replace the brake cable housing. I decided to keep the shifter cable housing original. Although the outer casing is cracked in areas, far less forces are exerted on shifter housing and the interior coils were fine, so I lubricated the original shifter housing and installed a new cable, which had to be sanded down a bit in order to fit into the Simplex shifter mechanism. 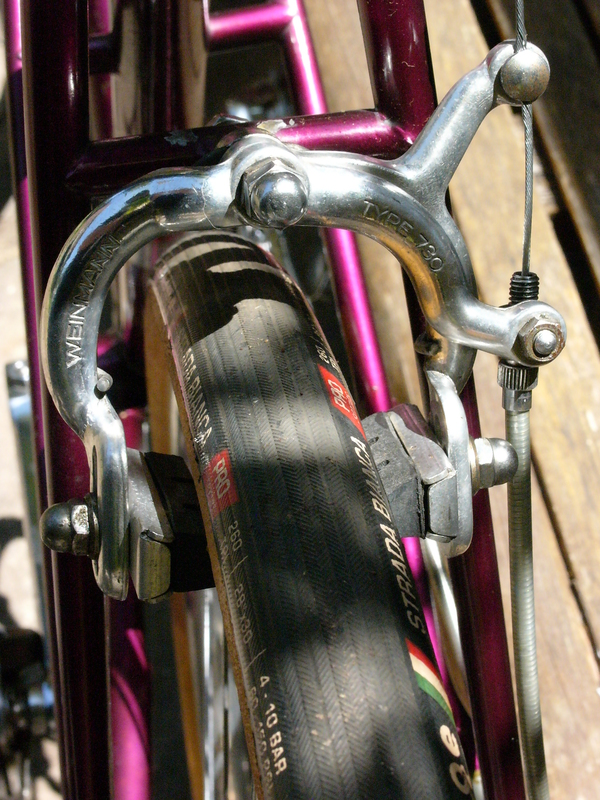 I did not install the Melas fork mount dynamo – it had probably failed long ago and was not useable. I hooked up the pretty rear lamp, and will now try to source a fork mount dynamo from the period which has an integrated head lamp. 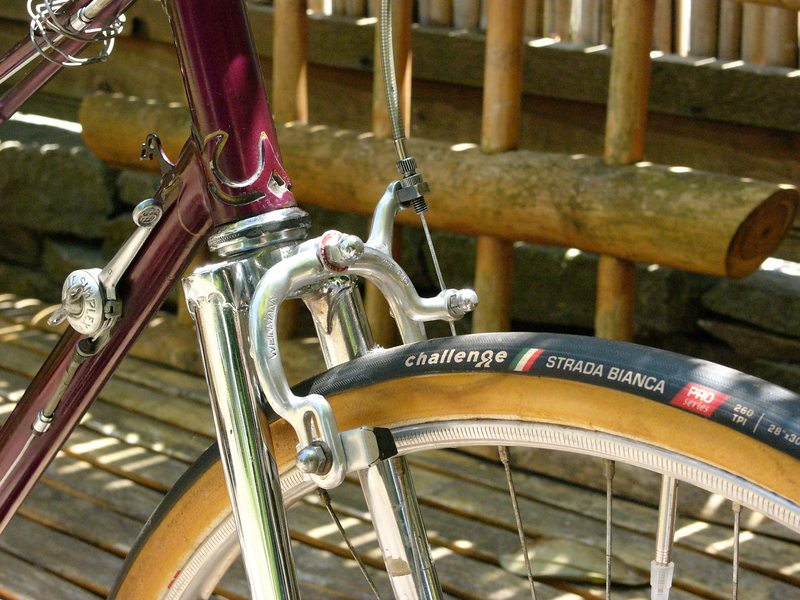 I have yet to test ride the bike and to experience the tubular tires, the mounting and gluing of which not only expanded my knowledge (and possibly fried my brain), but made me feel glad to live in the era of high performance, supple clinchers. Back then, tubulars were really the only option for comfort and performance. I’ve got some friction in the rear brake cable, and I suspect I’ll also have a bit of noisy braking when I venture out. So, there’s more effort still to make in getting this bike back on the road. It will be interesting to see how the bike rides, given its contrasting features. 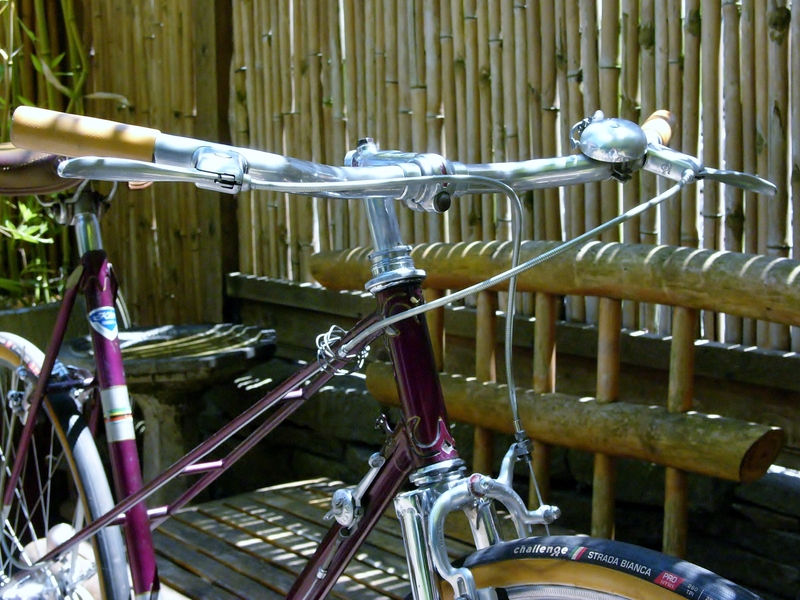 This entry was posted in Bicycle restoration, Mixte bicycle, Vintage bicycle, Vintage bicycle restoration, Vintage French Bicycle and tagged bicycle restoration, F.B. 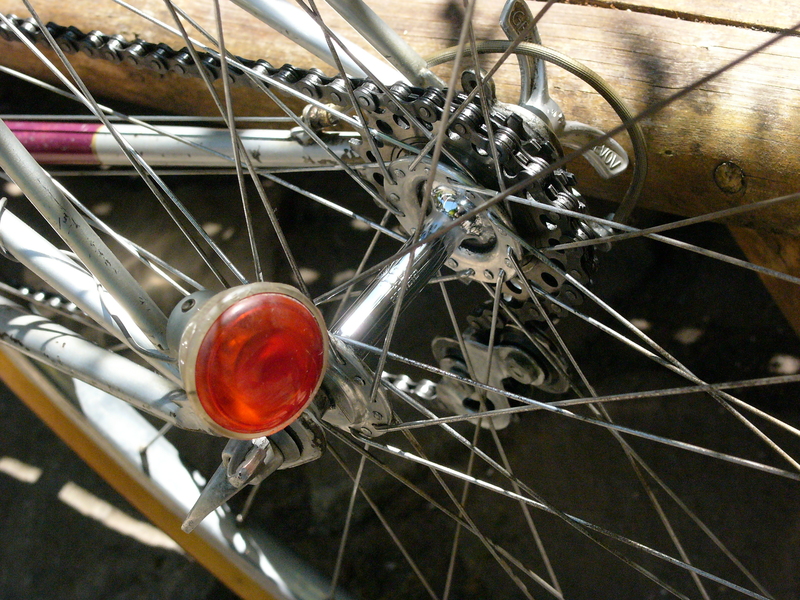 hubs, French bicycle, Gevov wingnuts, Mixte, Oscar Egg lugs, simplex Tour de France, vintage french bicycle by Nola Wilken. Bookmark the permalink. 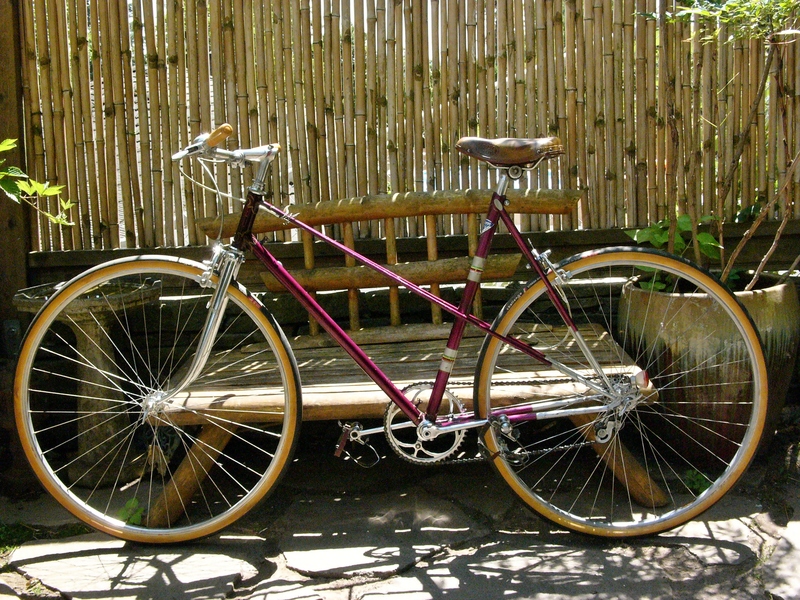 What a gorgeous, graceful Mixte! I don’t feel that this style frame gets nearly enough air play so I am thrilled to see you overhaul and refinish yet another for the world to enjoy. 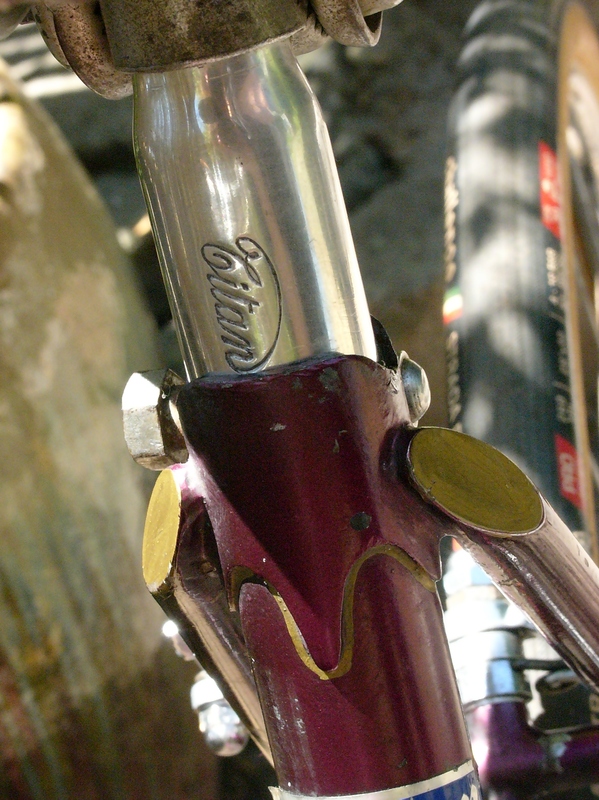 The Titan seatpost is quite understated and classy with it’s demure scripting, only being noticed when one takes the time to enjoy the subtleties the bicycle has to offer. Good luck sourcing the fork mount dynamo. I’m sure with patience you will find it. And when you do, this original post would be a great place to show the updated look! Thanks for your comments. I agree that Mixte frames don’t get much airplay. This one is the right size for both medium sized male riders and taller female riders who want the convenience of mounting and dismounting in regular clothes, or just don’t like swinging a leg over a high top tube. In fact, that was the primary driver behind the development of the Moulton bicycle. I will be curious to see how the stiff the frame is given its very narrow diameter twin sloping top tubes, as one complaint I have about Mixte frames is their handling which I think is compromised when the builder uses only a single top tube. The twin tubes are much stiffer, in my experience, although I have never ridden a mixte frame with twin top tubes of such narrow diameter. My freewheel remover for this Regina freewheel turned out to be a Suntour 2 prong remover, which happened to work on this older Regina freewheel, and thankfully the freewheel came off with only minimal effort. 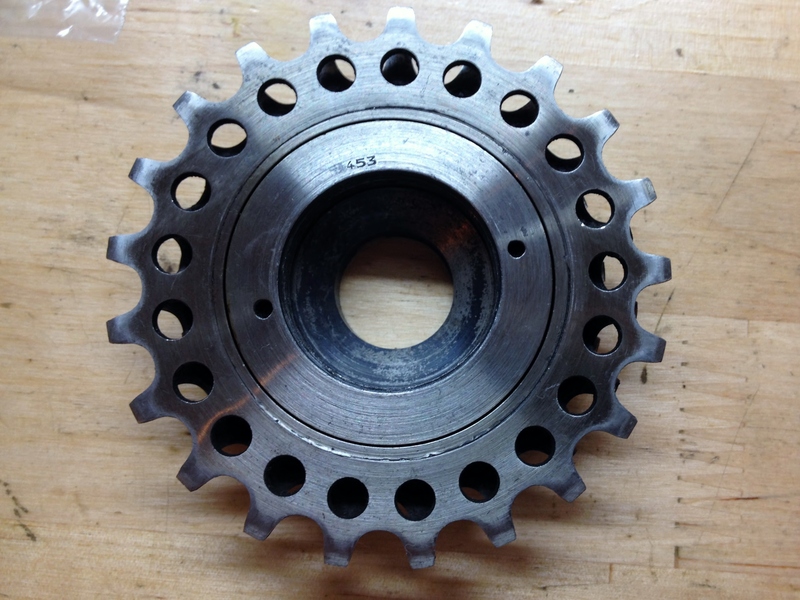 For really old Cyclo and other French freewheels, I have remover that was machined by Brett Fleming, of Efficient Velo Tools, here in Pdx – a great resource for unique and hard to find shop tools. Intriguing, beautiful machine. Happy she’s found someone like you to appreciate her! So impressed with your intrepid, mechanical sleuthing to take on such projects. A 1970 Jack Taylor Ladies Marathon Racer I’ve acquired has tubular tires also, a surprise to me and a bit unnerving thinking of flatting on the road. 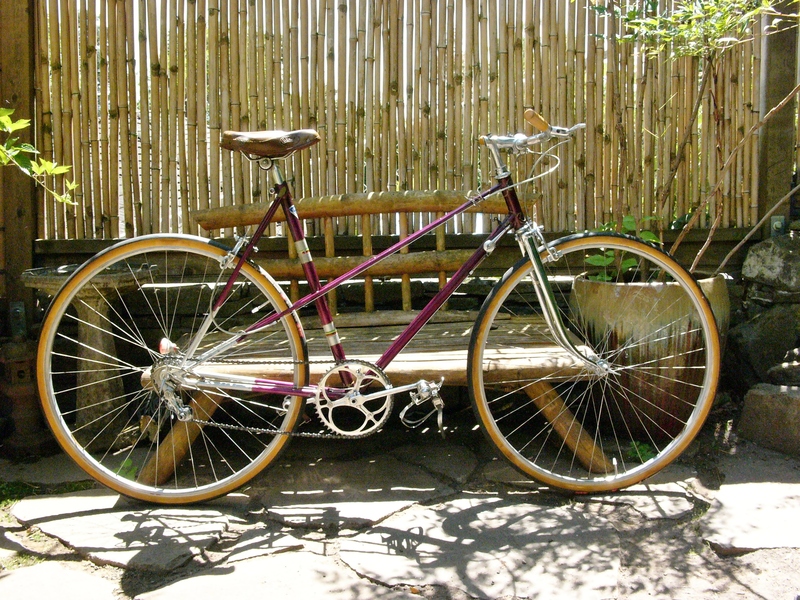 I am partial to the twin top tube mixte bikes. 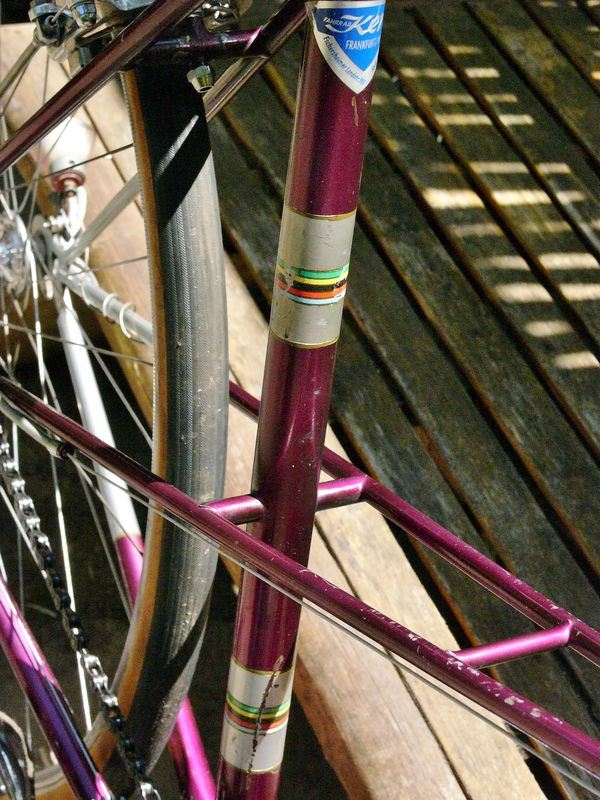 My vintage Miss Mercian, set up with drop bars, is rock solid and surprisingly fast with a very competitive performance and ride. Sounds like you have some nice machines. 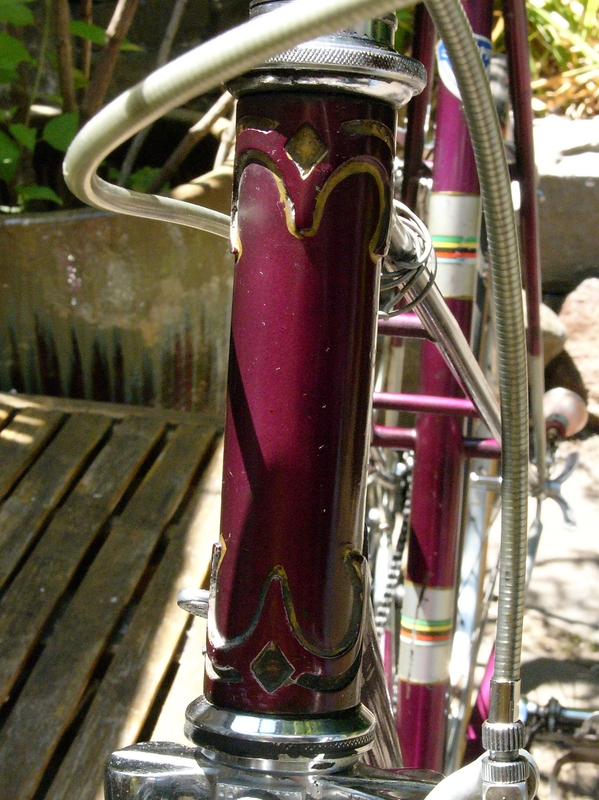 The vintage Miss Mercian’s are hard to come by. I will follow up my post with riding impressions once I have this beauty out on the road, although I will probably avoid really spirited riding as I adjust to the tubular tires, and I certainly will pray for no flats!